After many months working on a new orchestral composition, Idara Aguinaga will be taking a break from composing and will perform a special Mother's Day Concert in beautiful Kalispell Montana @ 3pm at the Bethlehem Lutheran Church. Idara Aguinaga - Composer In her many gifts as coloratura soprano, violinist, teacher, conductor, composer and classical music critic, Idara Aguinaga will begin composing her next classical symphonic masterpiece. It will be presented to and performed in public upon its completion. We all look forward to hearing the brilliance and depth of Ms Aguinaga's work in the near future. Idara Aguinaga - Violinist With her great love of classical music Idara Aguinaga joined the Glacier Symphony on her violin October 14th and 15th as they perform Beethoven's Symphony No. 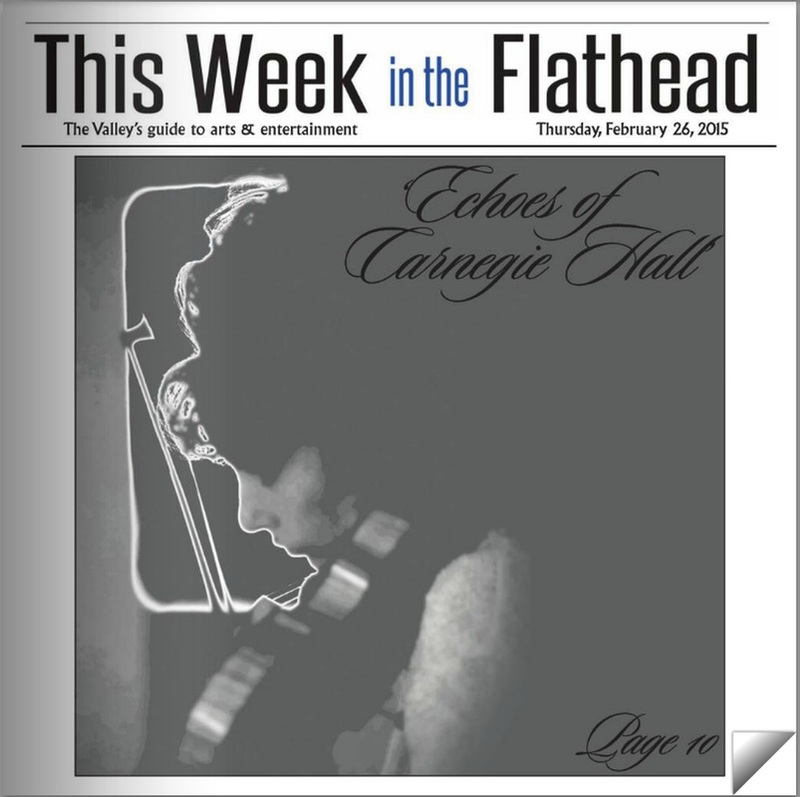 9 at the Flathead Performance Hall. Her dynamic and passionate playing brought brightness and color to this world famous symphony by Ludwig van Beethoven. Idara Aguinaga - Coloratura Soprano was part of the Easter celebrations at Trinity Lutheran Church, Kalispell, MT. Maundy Thursday, April 13th, she performed on the violin Meditation from Thais. On Good Friday she sang Via Dolorosa and for Easter Sunday sunrise service she sang Mozart's Alleluia. Idara Aguinaga - Coloratura Soprano performs "Panis Angelicus" at the beautiful Cathedral of St Helena in the capital of Montana with organist Dale Fleck. Ms Aguinaga's spectacular vocal attributes astounded the packed cathedral with her angelic voice and brought many to tears with her passionate and dynamic performance. Featuring adjunct professor Idara Aguinaga performing on violin along with other instrumentalists including Griffin Browne (cello). Ms Aguinaga was responsible for starting the string orchestra at the college which today has now expanded into a full student orchestra. The concert will include the FVCC music professors showcasing their best with amazing solos, duets, and trio performances. Works to be performed include solos from 'Bach Unaccompanied', 'Bloch's Nigun' and more. Don't miss this special faculty concert and come support the FVCC Music Dept. A Compilation of Idara's Best "1st Year" Performances - Demonstrating her exquisitely gifted voice and Highlighting her stupendous vocal attributes, range and technical precision. The Prelude CD embodies what it means to sing as a True Coloratura Soprano. 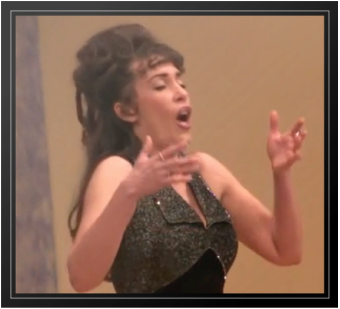 Ms Aguinaga astounds listeners with operatic feats only the top opera voices in the world dare attempt. 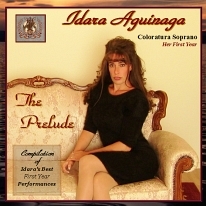 The fame and spender of these cherished coloratura classics are once again revived right out of history and performed with the passion and artistic emotion that only Idara Aguinaga can deliver and the original composers could only of first hoped for. Buy her fabulous CD Here. 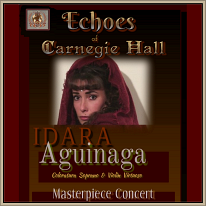 Ms. Idara Aguinaga -Dramatic Bel Canto Coloratura Soprano & Violin Virtuoso Extraordinaire announces the release her newest (67min - 12 track) CD "Echoes of Carnegie Hall." Idara Aguinaga will perform a special Mother's Day concert in beautiful Kalispell Montana @ 3pm at the Bethlehem Lutheran Church. Click Here for more information. Idara Aguinaga will be taking a reprieve from regular performances to begin 'composing her next classical masterpiece.' It will be presented to and performed in public upon its completion. We all look forward to hearing the brilliance and depth of Ms Aguinaga's work in the near future. Idara Aguinaga was part of the Easter celebrations at Trinity Lutheran Church, Kalispell, MT. Maundy Thursday, April 13th, she performed on the violin Meditation from Thais. On Good Friday she sang Via Dolorosa and for Easter Sunday sunrise service she sang Mozart's Alleluia. Idara Aguinaga - Coloratura Soprano has been invited to sing a solo of "Panis Angelicus" and Handel's "Let The Bright Seraphim" Nov. 20, 2016 before the Tenth Bishop of the Diocese of Helena. Idara Aguinaga - Conductor/Composer will be directing The Valley Voices Choir with the FVCC Orchestra at the October 23rd fundraiser concert "Montana to Carnegie Hall". JPII Fundraiser Concert - 7pm Bigfork, MT. 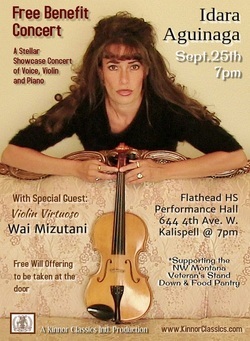 - Idara Aguinaga performs classical violin to raise funds for community youth programs. Blessed Trinity in Missoula, MT. - Idara Aguinaga, Wai Mizutani, Patrick Jones, and Ladeine Thompson. More Info. FVCC Spring Concert Series Featuring Idara Aguinaga performing - Fruhlingsstimmen and the Flower Duet from Lakme. CLASSICAL CONCERT - 7pm at Holy Rosary Cathedral in Bozeman, MT. - Idara Aguinaga to sing the reverent classics: Panis Angelicus and Ave Maria, as well as perform on violin several classical pieces. FHS Performance Hall Kalispell, MT. 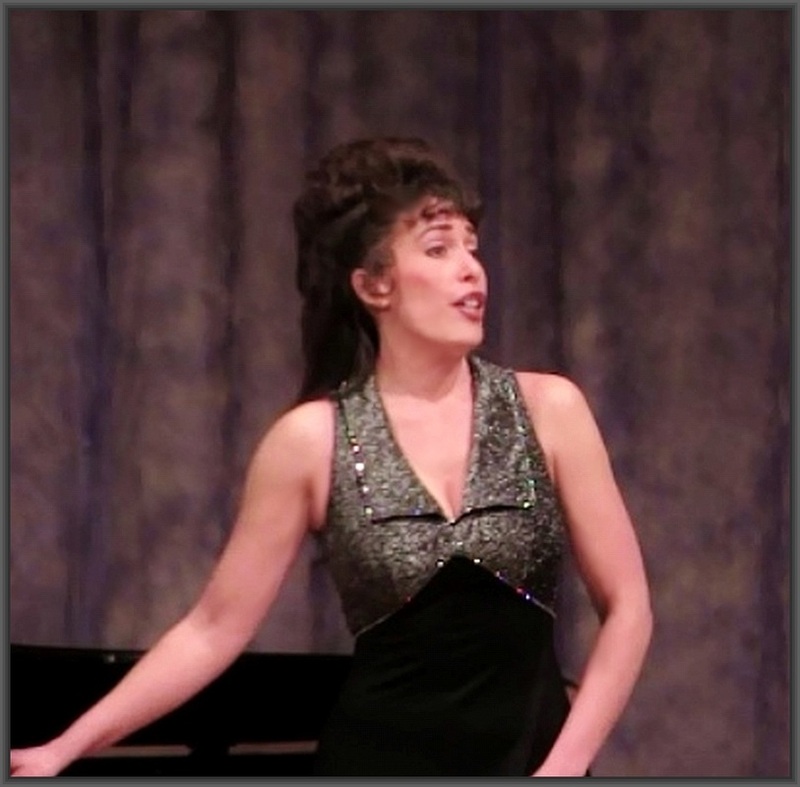 Echoes of Carnegie Hall: "an accomplished violinist and gifted coloratura soprano....Her vocal range is stunning... "
Daily Inter Lake news article by Stefanie Johnson. Full feature article of Idara Aguinaga's upcoming concert 'Echoes of Carnegie Hall', her life and her classical music background. Welcomes you to our website. We appreciate your patience as we continue re-building our website. Over the next few months, we will be adding new relevant material and content. Our primary focus will remain the promoting of select gifted Artists and their music and helping visitors gain a fuller appreciation for the classical genre. KinnorClassics.Com will continue to featured World Renown Artists and their talents - exhibited through Concert Promotions, Multi-media, News Articles, Industry Profiles, Valuable Resource, Links and more. ﻿﻿Kinnor (Hebrew: כִּנּוֹר‎)﻿ ﻿is an ancient Israelite musical instrument. The kinnor is the first string instrument to be mentioned in the Bible, appearing in Genesis 4:21 and was typically played with a plectrum (pick), though the Book of Samuel in the Bible notes that David played the kinoor "with his hand. It has been referred to as the "national instrument" of the Jewish people. The word kinnor is used in modern Hebrew to signify the modern Western violin.